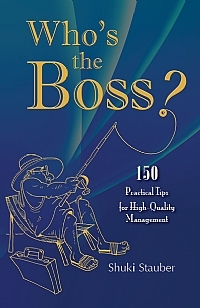 ‘Who’s the Boss’, presents 150 practical tried and true methods for quality management. Together these methods comprise a complete management toolkit, presented in a concise, clear and easy to implement manner. Each method is accompanied by an example from a real-life situation based on the experience of many managers in leading organizations. A great guide for managers and employees in large and small organizations.